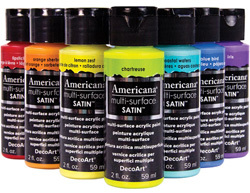 These acrylics are premium, all-surface, indoor/outdoor, satin finish paints with excellent coverage. They are self-sealing, so no primer or varnish is required. They offer superior adhesion on all surfaces, including glass, which is bakeable for a dishwasher-safe finish. They are made with permanent, lightfast pigments and are water-based and non-toxic. They are quick and easy to clean-up and are made in the USA. The GALLERY / art placement inc.